Over the weekend the Otakus & Geeks to a trip to Williamsburg, Brooklyn NY to check out ALITA: BATTLE ANGEL - PASSPORT TO IRON CITY. ALITA: BATTLE ANGEL - PASSPORT TO IRON CITY transports visitors directly into the futuristic world of Robert Rodriguez, James Cameron and Jon Landau’s upcoming film in advance of its February 14 opening. Guests explore the movie’s Iron City, which has been recreated down to the last detail by the film’s production designers, where they interact with the City’s gritty residents, experiment with custom technology built for the retro-future Alita aesthetic, and uncover hidden clues to determine their fate with the city’s controlling force. PASSPORT TO IRON CITY fully immerses travelers into the world of Alita's touching cyberpunk story, and is unlike anything else. I have to say that Passport to Iron City did as advertise. It is a very fun experience. We were first had to pick up our Iron City ID's because you can't go anywhere without it. After we received our ID's we were seated at a table to await preparations. Each person were seated at table with the color that their ID registered them. We were the red team. At the table we observe the tablet on the table to get a brief history of Iron City. We also received a map of the place. After all the teams were seated we then were then greeted by a citizen of Iron City. She discuss the basic rules and how we can earn credits. Credits is the name of the game in Iron City. If you have no credits you have no life. After preparations were completed we finally enter Iron City. The cyberpunk setting, actors with their costumes and performances really nailed the tone of the soon to be game. Once in Iron City the rules were explained. The team with the most credits will win something special. 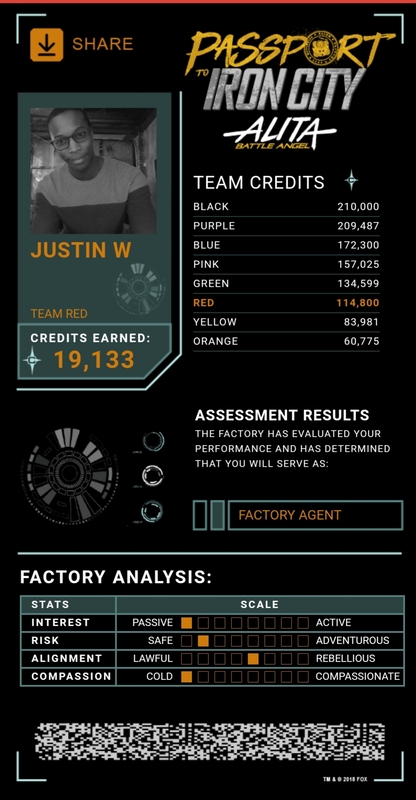 In order to win credits you had to win credits at the various location in Iron City. However there is a catch you're on a time limit and only have 40 minutes to get the most credits. The various locations are the Marketplace 1 and 2, Scrapyard Scavenger, Iron City Propaganda, Dr. Chiens Enhancements, Bounty Hunting Surveillance and finally Motorball. Each location requires certain skills logic, sensory, risk taker or active. See the map below for more details of the layout. To begin one person from each team had to select a card from a hat to determine which location each team would start first. I was selected to lead. I pulled out Marketplace #2. Here the team had to use the skill of sensory by guessing what type of food is in the bag without looking by just touching the food with your hands. Trust me this was not easy but we managed to win and was award plenty of credits. After we left the market place we were greeted by the highlight of the event. An Iron City citizen who told us he would give us credits if we can find the secrets. By entering codes in the panel presented and looking around the whole city for clues we will be rewarded. We managed to solve one puzzle and was rewarded credits. However this peddler took a significant amount of time and we were losing. After we left we went to the Scrapyard and this was my favorite game. We had to scan as much junk as possible and present the merchant with the one that had the most credits. This game requires speed, teamwork and a little multitasking. We didn't find the most expensive parts but we did get enough credits to put us back in the game. Time was now running low and we were greeted by another citizen who promised us credits if we can solve a jigsaw puzzle. I will say that the puzzle was at normal level but difficult when you're with a team and only have three minutes to solve the puzzle. We unfortunately didn't succeed at this puzzle and return to try to solve the peddler's secrets. While trying to solve we went to Marketplace #1 where we had to use our sense of smell. Once again a difficult challenge because what you think you're smelling isn't. With time running low we had to go to Motorball which we can bet all your credits or the least depending on your ranking. Motorball is a race where you select which Cyborg will win. Since we were losing we bet all of it and selected the right Cyborg and managed to end in 6th place. Passport to Iron City was definitely worth the time and a very fun experience. Great setting, challenging games and the actors/hosts made sure you felt you were in Iron City. Take a trip to Iron City while you can. Alita: Battle Angel hits theaters on February 14th 2019.